Fresno Surgical Hospital is a 27-bed, surgical hospital located in Fresno, CA. The hospital prides itself on serving over 18,000 surgery patients annually in a comfortable, hotel-like setting. The accounts payable (AP) department processes approximately 1,500 invoices per month. Prior to Laserfiche the invoice process was manual and paper-intensive. Invoices were received by mail and sorted by the AP clerk into individual folders based on approving manager. The AP clerk walked the folders to the hospital (a separate physical location from the business office) and distributed them to the appropriate managers. Once each manager reviewed and approved the invoices, he physically returned them to the business office. The AP clerk then quality checked the invoices, ensured that they were approved, and coded them if the manager had not done so already. The invoices were then manually keyed into the Meditech accounts payable system. Lastly, the clerk filed each invoice in a special Open Check file folder to await payment. Once payment was issued, the clerk attached a copy of the check to the invoice and refiled the whole packet in the appropriate vendor folder in a file cabinet. On a regular basis, expense review required invoices to be pulled, analyzed, and refiled in long-term storage. Annually, the hospital filled and stored between four and six three-foot wide, four drawer file cabinets with invoices and associated payment detail. This process has been completely re-engineered with Laserfiche Import Agent, Workflow, an integration with Ancora image capture software, and Meditech import utilities. It is now streamlined and completely paperless. Recent growth of the hospital has resulted in a 33 percent increase in the number of invoices processed. Although the increase was substantial, the automation has resulted in improved efficiency, allowing the hospital to maintain the same level of staffing – a savings of over $55,000 a year. Now, incoming invoices are scanned into a network drive where Ancora utilizes pre-defined, vendor-specific templates to extract pertinent information including vendor name (fixed print or vendor logo), invoice number, invoice amount, total amount, freight, and sales tax. 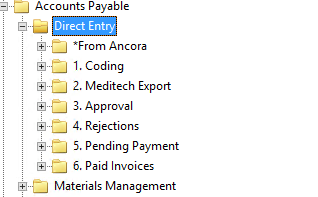 From the extracted information, Ancora searches the Meditech database for the appropriate vendor number, attaches this information to the record, creates a batch file and deposits the file on the network drive. Import Agent routes the invoices and the batch file into a folder in the Laserfiche repository. Laserfiche Workflow extracts the information from the batch file and adds it to the invoices as metadata. Workflow then moves the invoices to the Coding folder for coding. Ninety percent of incoming invoices follow historical coding and managerial approval workflows. Laserfiche Workflow uses the vendor number to perform a lookup in a database and assigns the anticipated coding and approving manager for each invoice. Workflow adds the coding information in a yellow textbox annotation at the top of the document, and the approving manager in the metadata. The AP clerk reviews the invoices in the Coding folder and modifies the coding and approving manager where necessary. Upon acceptance, Workflow builds a flat file with the invoice details to be uploaded into Meditech. Each manager has his own folder in Laserfiche under the main Approval folder. 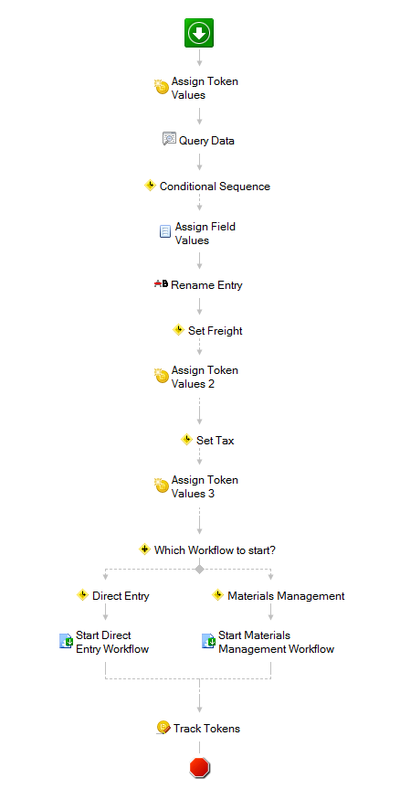 Once the invoice is coded, Workflow routes it to the appropriate manager’s folder for review and approval. The manager can either approve or reject the invoice. 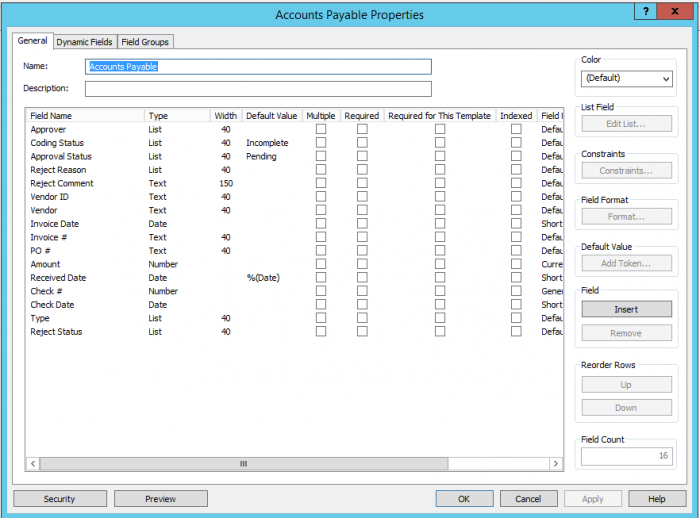 Once the invoice is approved, it is routed to the Pending Payment folder to await payment. Rejected invoices are reviewed by the accountant for appropriate remediation steps. When payment is issued, Workflow retrieves the payment information from Meditech and populates the metadata with the check number and check date. Workflow then routes the invoice into the Paid Invoices folder, where it is filed by payment date. Invoices with associated purchase orders follow a similar path to that of non-purchase order invoices, in that, Ancora utilizes pre-defied templates to capture vendor name, invoice date, totals, and other pertinent information. However, in addition, Ancora captures line-level detail (catalog number, quantity, unit price, and extended price) from the invoice. Workflow then matches this line-level information to the Meditech system and develops a HL7 file, which is uploaded into the Meditech Materials Management/Accounts Payable module for further processing. Invoices that match with an associated purchase order do not need to go through the same approval process as other invoices. After coding, the invoice goes directly into a holding folder awaiting payment. 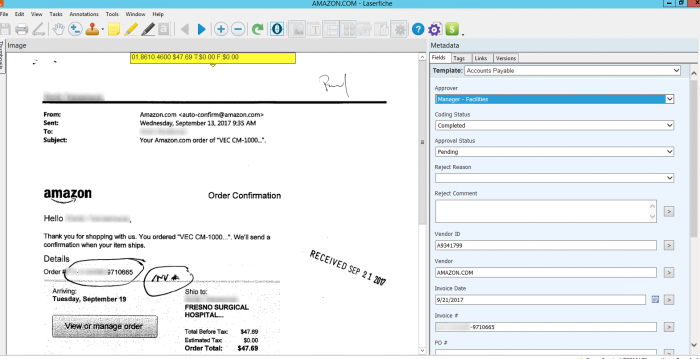 All invoices and purchase orders can be viewed directly from within Meditech through an integration using Laserfiche Connector. Even though the number of invoices received increased by 33 percent, the hospital has not needed to allocate additional resources to the process, resulting in an annual savings of at least $55,000 per year. 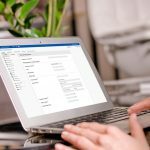 Invoices are approved by managers more quickly, as they receive a daily email notification until the invoice is approved. If an invoice is not approved within a week, the Controller is notified. The ease and speed of retrieving information from Laserfiche has made expense analysis significantly easier. Information is readily available and easily viewed on screen, which saves thousands of dollars in man-hours.